The gold helmets that are the calling card of Notre Dame football were held high in triumph as the Fighting Irish trotted off Ryan Field in celebration of their 31-21 victory over the Northwestern Wildcats. The classic gold matched up with Northwestern’s throwback numbered helmets was emblematic of the first-half: Tough, grind-away offense that resulted in low-scoring. Each team had a pair of missed field goals and their respective touchdown drives each lasted over five minutes. 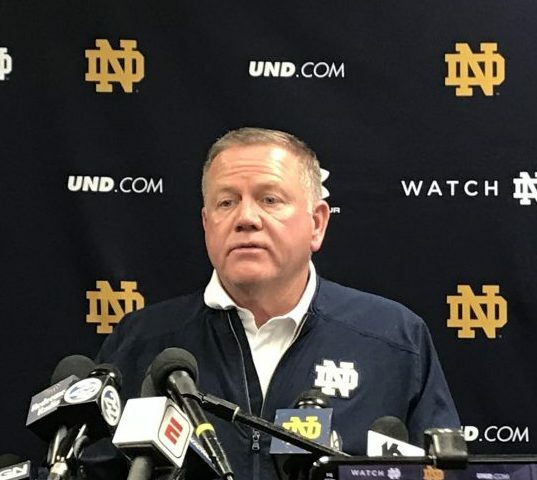 Starting on their own 21 and following a missed Wildcats field goal, Notre Dame chipped away at a physical Northwestern defense for 14-play, 79-yard drive that lasted five minutes and 33 seconds. Two possessions later, Northwestern went on their own grueling march in which they ran the ball on 12 of 18 plays for a 73-yard touchdown drive. Notre Dame entered the locker room in what had become the all-too-familiar territory of a sluggish start. Book settled in after completing seven of 15 passes in the first-half. 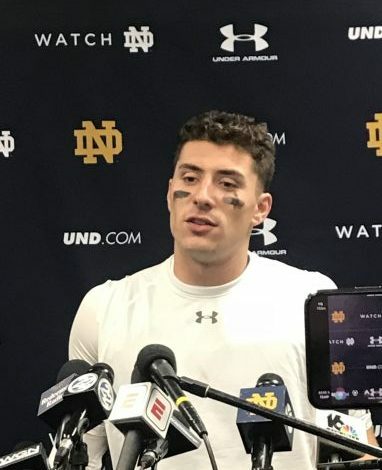 He got into a rhythm coming out of the gates, leading an 80-yard drive on Notre Dame’s opening second-half possession, hitting his receivers in stride and eventually linking up with Miles Boykin for a 20-yard touchdown to go ahead 14-7. Notre Dame’s next drive saw Book lead a drive of chunk plays to go 98 yards for a score, and just like that, Notre Dame was up 21-7. Book would finish his day with 343 passing yards and 62 yards rushing, including a 23-yard, game-sealing score. Northwestern’s stout run-defense neutralized Notre Dame’s ground attack, which meant Book had to respond. And respond he did. A big part of how he found success was his connection with receiver Chase Claypool, who finished with eight receptions for 130 yards and was there to move the chains when needed. The Notre Dame defense did its job, allowing only 249 yards of total offense. They kept Clayton Thorson on his toes and kept him from getting comfortable in the pocket. They sacked him five times and constantly flushed him out of the pocket, preventing him from getting into any sort of rhythm, which is when he becomes most dangerous. Despite two second-half touchdowns from Northwestern, one of which was made possible by a blocked punt that gave them a short field, Notre Dame’s defense kept the Wildcats in check throughout most of the game. Notre Dame now moves to 9-0 and their status as a Playoff contender remains intact. Being an independent team, going undefeated is one of the only ways they can make the Playoff. As it stands, they and Alabama are the only remaining unbeaten teams who have played entirely FBS opponents. Next week, they face a Florida State team that is in shambles and searching for an identity. If they take care of business the rest of the way, there is a strong likelihood the Fighting Irish will crash this year’s Playoff party.